It was supposed to be a surprise collaboration but fans knew it beforehand through this rehearsal clip. Many fans were already excited and anticipating TaeYeon singing 'See You Again' but when Wiz Khalifa's stage came up, she was nowhere to be found. There was no word from Mnet after the show but Wiz Khalifa tweeted which sounded like it was TaeYeon's fault but nope, it was because of the audio issues. Wiz Khalifa's DJ then added. After arriving in Korea, TaeYeon found it has become an issue that's why she explained. 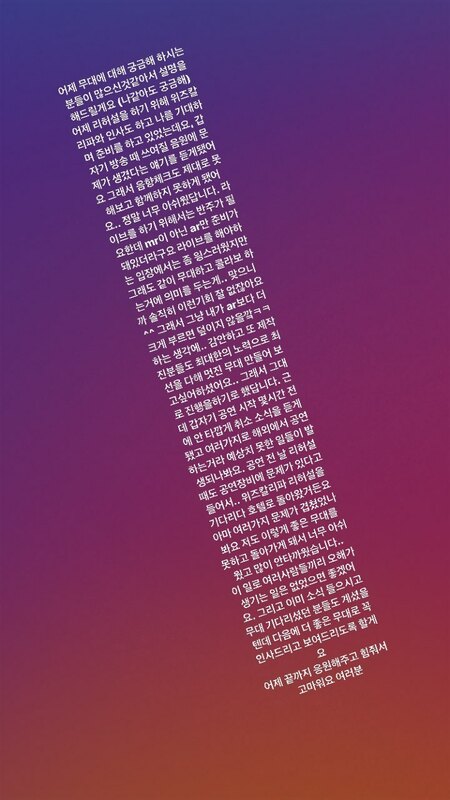 Translation: There were lot of you who were curious about last night's performance (if it were me, I'd be too) For the rehearsal, I prepared and anticipated a lot and said hello to Wiz when I heard that the audio for the performance has a problem. We couldn't even properly check the audio and the performance was dismissed... I was really disappointed. To do the performance live we need the MR not just the AR but it wasn't prepared. It was kinda weird that there was no MR but they want me to do live but I wanted to the stage anyway because this collaboration will be so meaningful...there aren't opportunities like this everyday ^^ so I thought if I sang it louder than the AR then problem solved ㅋㅋㅋㅋ everyone wanted to make the best stage possible... so we wanted to proceed, but few hours before it started, it got cancelled. Things happen and since we're performing it overseas there can be unexpected problems with equipment too... I was waiting for the Wiz rehearsal and just came back to the hotel. I think a lot of problems happened and I was really sad I couldn't do this wonderful performance. I hope there is no misunderstanding about this. I'm sorry for those who were waiting for this stage, I will show you better ones in the future. Thank you for cheering for me and giving me strength yesterday. When we thought its already over, Wiz Khalifa then said that TaeYeon claimed about going to the Hospital. To this, TaeYeon replied, "I didn't go to the hospital my friend.. I was washing up at this time while waiting for you." You can also listen to the snippet of TaeYeon's part below. If you missed it, you can still enjoy TaeYeon's 'Rain' performance at the 2016 MAMA here.